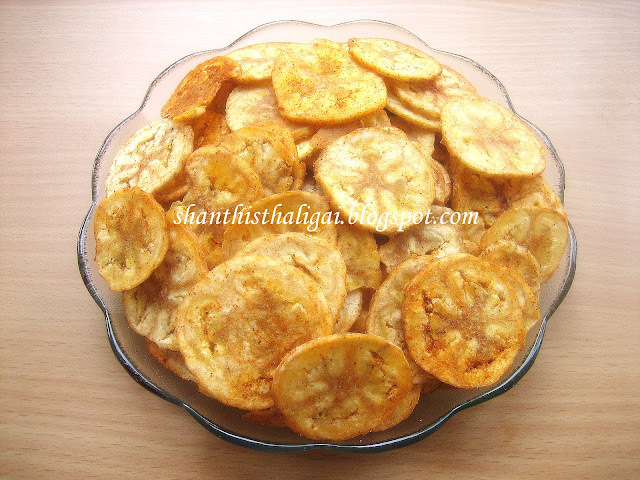 Vazhaikkai chips (raw banana) is invariably made on all Iyengar marriages and festivals. This is an excellent combo with Puliyodharai. It is so simple yet tasty. De-skin the bananas and put them in a vessel of water to prevent discolouration. Heat oil. Pat the bananas dry, use the chips cutter and slice the bananas directly into the oil. Take out when crisp or when the sizzling sound stops. Transfer it to a bowl and sprinkle salt and chilli powder. Toss the vessel till it is mixed well. Salt and chilli powder can be used according to one's taste buds. Shanthiji, chips are so tempting.. can I pick some? Yumm, they are my favorite. Looks Great Shanthi. I can finish the whole thing in one sitting. 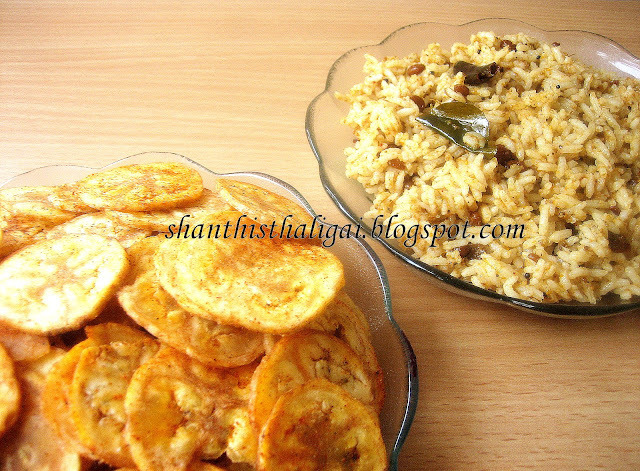 Yummy crispy chips with pulao. I loved your blog and real recipes there in. We all need traditional recipes more than anything else. wow reminds me of my patti.she used to do in the same way.we help her in slicing the bananas.Puliyodarai with banana chips wow heavenly combo!!! My fav!! looks so perfect and yummy!!! The chips look very crunchy. Ideal for evening snack. I regularly buy it from shop but from henceforth i would try following your recipe and prepare it at home. a great munch..but i am petrified to make these at home!!! Looks so tempting! I agree whole heartedly with you that this is a great combo with puliyodharai! Chips looks prefect and tempting..
my favorite...love it anytime..your have come out too good. lovely and crispy banana chips.